Single people have it relatively easy. They essentially have only nine options for when to start up their Social Security benefits: any year from ages 62 through 70. Like singles, each spouse has the same nine years to claim benefits. 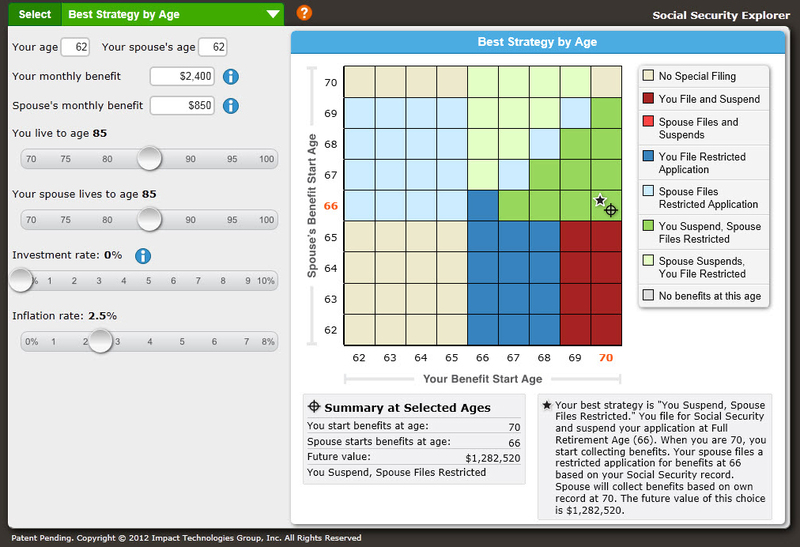 But the age factor increases the combinations of ages, for a couple, to 81. Freitag demonstrated Impact’s calculator for Squared Away. It displays a 9-by-9 grid with your potential filing ages – 62 through 70 – on the horizontal axis and your spouse’s ages on the vertical axis. After entering a few pieces of information about each spouse, a star alights in one of the grid’s 81 squares to identify the best age for each spouse to file, maximizing their combined benefits. Users can play around with the assumptions – longevity and interest rates – on the left and watch the star move around. At the same time, an estimate of the couple’s total benefits also appears and can be compared with comparable estimates in various scenarios. Every Social Security calculator has its benefits and shortcomings, which are detailed in this About.com article. Impact, for example, hasn’t yet incorporated divorced couples, widows and widowers, though it’s working on it. The free trial of the calculator for financial advisers and companies is available now; Impact plans to release a simpler consumer version later this year. But the commercial version is pretty simple. Try it! To answer questions about Social Security, AARP recently released an interactive tool online with questions and answers, a quiz, a slide show and other information. If it’s a free trial, why do they require my credit card information? Very annoying. They probably want me to subscribe in order to try it for free. I was unaware of the credit card obstacle. I’m working on finding out about it now and will provide more information as soon as I can. The Impact offer is for a 14 day free trial subscription. Nothing happens during that time. You won’t be billed unless you elect to keep your account open past the two week trial period. We need your billing information to prevent abuse and to verify you have a valid credit card should you elect to keep the account open. This prevents any interruption in service or need to re-register and create confusing or conflicting account id numbers and passwords. I am very willing to do a web demo personally for anyone who would like a guided tour. Email me a request so it can be schedules at a good time. No credit card required. Thanks for sharing this. I will be able to try out the free trial first.